Will Sondos Lamrhari be the 1st Montreal cop to wear a hijab? A 17-year-old woman studying police tech at Ahuntsic College in Montreal has inadvertently brought the current debate about whether police officers should be allowed to wear hijabs or turbans to a boiling point. Currently, Montreal police don't have a rule for or against it. They've never had to decide one way or the other. But Sondos Lamrhari might change all that. 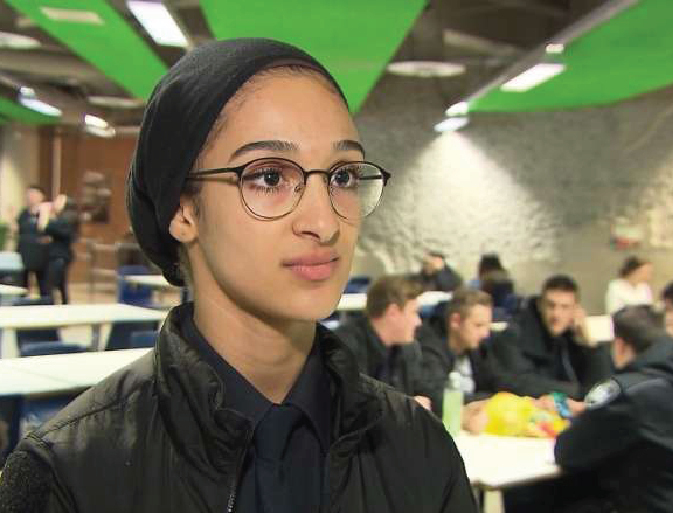 She's the first student in the province to wear a hijab and study police tech. But she says that shouldn't affect her chances of landing her dream job. "I feel like all the other kids. I don't think I have a better or worse chance of getting into this career path," she told Radio-Canada. Lamrhari has been wearing a headscarf since she was 14, saying she chooses to wear it because it fits with her "values and principles." She added that it has never impeded her in playing sports, studying or training. "The people who are against it, in a debate, they make the most noise," she said. "I take the Metro in my uniform. Any insults just motivate me." She has two years left in her degree and several years after that before reaching the stage of trying to get admitted to a police force. Still, Lamrhari dreams of working for the Montreal or Laval police, something the province's official opposition has said is absolutely out of the question. "A CAQ government would forbid any religious symbols for any employee of the state who's in a position of authority," said Coalition Avenir Québec MNA Geneviève Guilbault. The Parti Québécois agrees, with secularism critic Agnès Maltais saying her party would never allow Lamrhari to wear a head covering on the job. Meanwhile, Justice Minister Stéphanie Vallée spoke out in support of Lamrhari. "This young woman was born in Quebec. She wants to join the police force where we don't have a lot of women, let alone a lot of diversity. And the opposition are telling her, 'You know what, you can study, but if we govern, we won't allow you.'" Montreal Mayor Valérie Plante also joined in, saying Thursday afternoon that she wants all Montrealers to have equal access to jobs. She stopped short of making promises though, saying that it was not for her to interfere with police process. Just as the Montreal police have no set rule on head coverings for officers, the provincial police academy — known by its French acronym ENPQ — doesn't have a policy either. Yet. Communications director Pierre Saint-Antoine told Radio-Canada that Lamrhari's enrolment in September 2017 has "obliged" the administration to come up with an answer. "We are going to evaluate with our administration council and our training commission," he said. The council includes representatives from the SPVM, Sûreté du Québec, three major police unions, civil servants, and provincial ministries of Public Security and Education. The decision will have an impact on police forces across the province and is expected to be rendered in the coming months. It's worth noting that the RCMP allowed officers to wear turbans as of 1990 and hijabs as of 2016. Head coverings are also allowed in the Canadian military as well as in Toronto, Edmonton and Vancouver police forces.